I don’t know about you, but the fact that baseball season has commenced has brought a spring to my step and a joy to my soul. I can’t explain it, I think it has to do with my genetic code or how I was raised on WGN, but when I’m watching baseball, the world feels right to me. If I am lucky enough to watch it in person, well then, it’s just next level awesome. Throw in hanging with my three guys and honestly life could not get any better at Marlins Park in the heart of Miami, but then, it did! It totally did! As the first inning of game two of the four game series of Marlins vs. Cubs got under way, Mad Dog exited our row in search of a soft pretzel. Being opening weekend, there still were some kinks with customer service, so I knew he would be gone for a while. This didn’t faze me because I was at a baseball game! Life was good! Then, out of the corner of my eye, who strolls on in and sits right in front of me? I can’t really explain it to a non-baseball fan, but as the President of Cubs Baseball Operations, Theo literally transformed the Cubs into World Series Champions. 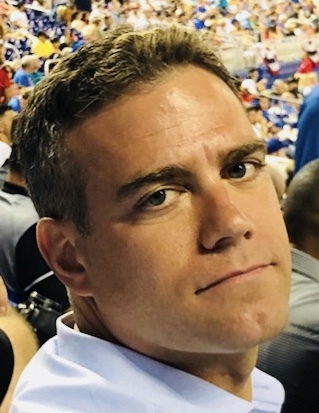 Theo Epstein took over the Cubs in 2011 after a 71-win season. This year, they won 103 games — and their first World Series in 108 years. How did it happen? We examine all his moves, big and small. Naturally, I about fell out of my seat. I was absolutely frantic. I couldn’t communicate to Full Speed that Theo was sitting in front of us. I didn’t want Theo to hear me talking about him because he WAS RIGHT THERE! And, then, Mad Dog took FOREVER to get back from the pretzel situation and this whole time I WAS DYING inside from excitement. Eventually, Mad Dog returned and I had finally communicated to Full Speed who was in front of us. I had him write a note to Mad Dog on a score card we had so again, I wouldn’t have to say Theo’s name out loud. From there at about inning 5, Mad Dog politely asked Theo to take a picture with me. I was so excited that’s why I look like a big cheeseball, and weirdly, Theo looks unaffected. Still, the picture is awesome! It kind of is more awesome because Theo looks so ‘overjoyed’. It is totally going to be this year’s Christmas card. And wouldn’t you know, this game ended up going 17 innings! The boys turned on us at about inning 13. They were so MAD. At about inning sixteen, I started to maybe wonder if it was time to call it, but I had to stay. I mean, I couldn’t leave my new best friend alone to shoulder the fate of our team. It doesn’t matter, once a World Series Champion, always a World Series Champion!